Early Cajun recordings are really something else – and in the US collecting them is sort of akin to collecting the rarest American blues records, except, quite possibly, even more rarified. There are a finite amount of early Cajun 78s, and when an exceptional Cajun disc turns up it is almost always played to death, with not one shiny groove. I’ll say upfront that I am not a Cajun collector. Though I love the music, my expertise is elsewhere. That said, I’ve managed to acquire a few rare Cajun gems that I treasure, by artists that I love. Most have already been lovingly transferred to CD (see the Resources page for in-print CDs of early Cajun music) – but I wanted to post this one, which has not made it to CD yet (though some mediocre mp3s float around) by one of the early Cajun greats: accordionist Joseph Falcon and his wife, the guitar player Cléoma Falcon (née Breaux). Rather than restate what’s been written by many other Cajun music experts, musicians, and writers, I’ll keep it very brief. Joseph and Cléoma were the very first Cajun musicians to ever record a 78, the oft-cited (and fantastic) tune “Allons à Lafayette,” in April of 1928. They had more or less a steady career on 78s as a duo until Cléoma passed away in 1941. Joseph continued his career until his death in 1965. This track, the name of which is commonly spelled “Sosten,” “Sosthene” or “Sothene,” is a waltz in G-sharp played on a C-sharp accordion, and was recorded in New Orleans on December 22, 1934. This was the Falcon’s very first song recorded for their first session for Decca Records. It has since been covered by many contemporary Cajun artists such as Michel Doucet and Wayne Thibodeaux. 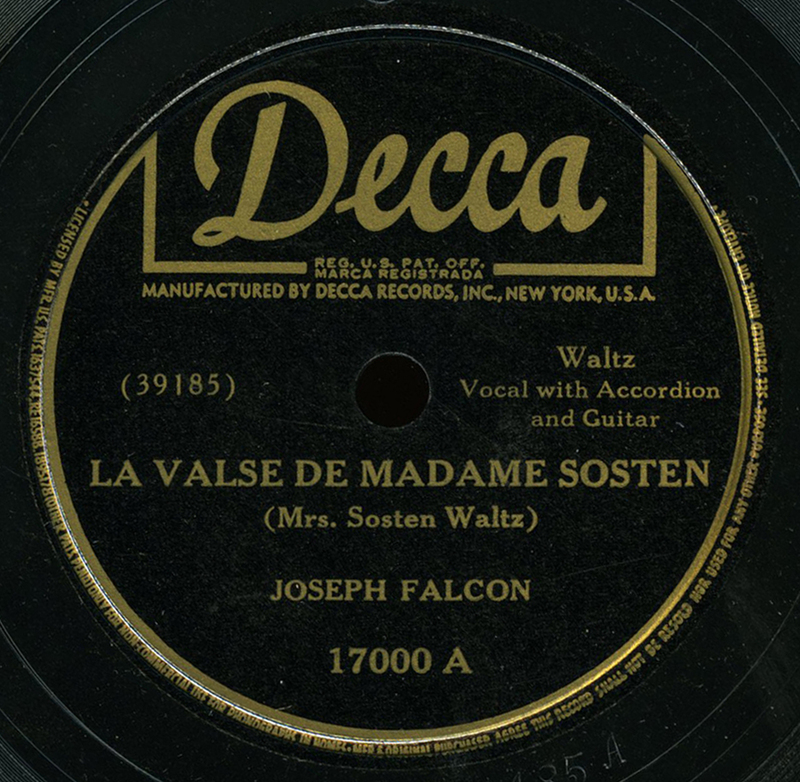 Lyrics for this song are online, but they are not quite the same as Falcon’s version, although Falcon’s version does begin with the standard line: Oh, Madame Sosthene, mais donnez moi Alida; cette la j’ai aime depuis l’age de quatorze ans (Oh, Madame Sosthene, give Alida to me; the one I’ve loved since the age 14). The Falcons would record 40 songs for Decca over the next 3 years. Novice that I am, Dave Murray pointed out to me (and I’m paraphrasing) that the notes on the bass side of the accordion, when played in 2nd position, create a harmonic clash on the resolve. So at the end of each phrase, you can hear a distinct clash between Cléoma’s guitar chord and Joseph’s accordion. Beautiful. I think this might be the first record on Excavated Shellac that I’ve heard before (although I might be wrong, without going back to check), but thanks for a copy that is sounding so good! I’ve loved the Falcons for more than 30 years and their music still does it for me. Re the key – it can’t be in G# (8 sharps) on a C accordion (no sharps). Relative to the tuning of the accordion, it must be in G. If it’s sounding in G#, the accordion would have to be tuned to C# – not impossible, but only accidentally, I’d have thought. What’s on the B-side I’m curious? Thanks, Bruce. The flip side is “Mes Yeux Bleus” sung by Cléoma. Welcome back + many thanks for this + the previous two posts; all great stuff with considerable interest. Bravo young man! I shall be taking the liberty of playing it in my very next show, best regards. I’m Joe Falcon’s gr-grand-cousin. Madame Sosthene is Josephine Trahan, wife of Sosthene Falcon, Joe’s uncle. I keep the family history and have a picture of her and Sosthene in my archives. Good stuff. Thank you, Wade – wonderful that you are keeping the archives alive! I can relate to your comment about Cajun 78s being “played to death, with not one shiny groove”. I was lucky enough to find a few back when I lived in the Beaumont, Texas area, dating from the late 20s to the early 40s. Despite the surface noise, they are still a good listen, and the pride of my small collection of 78s.